Samsung Galaxy A50 managed to bag a good score in our review. It was recently launched in the sub Rs. 20,000 segment as an attempt to strengthen Samsung’s presence in this segment. The phone performed well in our tests and we found the Exynos 9610 to be capable of pulling day-to-day tasks off without breaking into a sweat. We also liked the fact that the phone ships with One UI on top of Android Pie. The phone ran on the February security patch when we reviewed it but has received a couple of updates since then, and now, it has received its third. The latest update fixes connectivity issues with the Smart View feature. 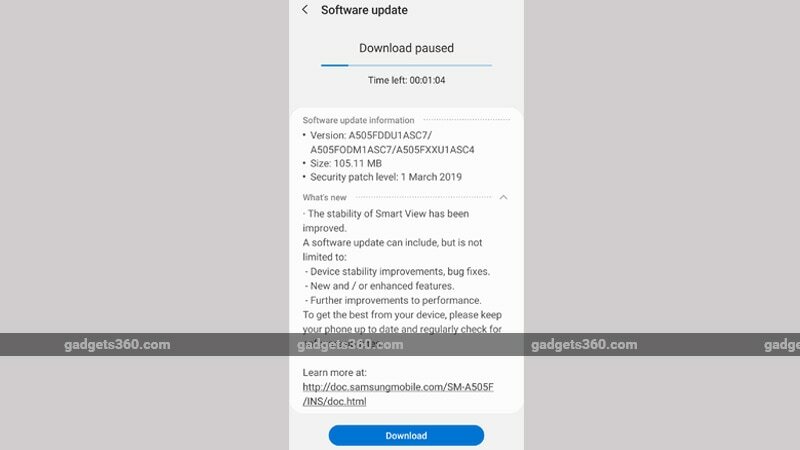 To recall, the first Samsung Galaxy A50 (Review) software update brought the March Android security patch along with improvements to the camera performance to the smartphone and was 138.67MB in size. Soon after this update, Samsung rolled out yet another update to the Galaxy A50. This new software update was aimed at improving the performance of the in-display fingerprint scanner on the smartphone. Samsung rolled the second update out days after the first one and also brought stability updates for the smartphone. This update, however, caused an issue with the Smart View feature on the smartphone causing it to not work properly. After the second update, the Galaxy A50 would take a long time to connect and then failed to maintain the connection. While a lot of users complained about this, Samsung was quick to fix this issue and is now rolling out a fix. A new software update is now available for the Galaxy A50 which fixes the connectivity issue with Smart View. The new software update brings software version A505FDDU1ASC7 to the smartphone and weighs 105.11MB. If you have a Samsung Galaxy A50 you can go to Settings > Software update > Download updates manually. This should download the update on the device directly. We hope this update solves the issue without introducing new bugs. The update’s rollout was first spotted by SamMobile. We were also able to verify the rollout on our review unit.